Axiomtek, one of the world’s leading designers and manufacturers of innovative, high performance and reliable PC-based industrial computer products, has introduced DSB550-880, its new high-performance digital signage player featuring the 4th generation Intel® Core™ i5 processor with the Mobile Intel® QM87 Express chipset. With three independent displays and 4K display capability, the DSB550-880 is a great solution for users looking for a simple-to-implement digital signage player. The all-in-one signage box computer supports up to 8GB of DDR3L memory, USB 3.0 interfaces, three independent displays with dual HDMI and DisplayPort interface, and network connections through LAN, WiFi and 3G/4G or LTE. Two PCI Express Mini Card slots are available for wireless communication module or TV tuner card. It also comes with 2.5” SATA HDD and mSATA for maximum storage capacity. With our new compact, smart signage player, you can deliver attractive digital advertisement to your audience anytime, anywhere. 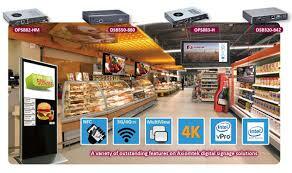 Axiomtek’s DSB550-880 comes with multiple display outputs: one DisplayPort and dual HDMI. Networking is provided by one Gigabit Ethernet port and optional 802.11 b/g/n WiFi connection. The signage platform also supports two USB 3.0 ports, two USB 2.0 ports, a RS-232 port, audio port, 2.5” SATA HDD drive bay, mSATA, and two PCI Express Mini Card slots. This super compact signage box system can be wall mounted or VESA mounted.